LOS ANGELES, CA -- (MARKET WIRE) -- August 3, 2006 -- News headlines are filled with stories about teens lured into dangerous situations by people posing as talent agents or photographers on Web sites, in malls and other places. "The Modeling Police," Hollywood agent/author William Squire and actress/model and mother Laura Boulay, have developed the Superstar Safety Survey to help teens and parents test their knowledge about being discovered. Their goal is to help people stay safe and to expose modeling scams that may cost people lots of money. Co-authors of "The Model's Workbook," Boulay and Squire are industry insiders who act as mentors to budding talents nationwide. "We are here to help people succeed," said Boulay. "We believe you can become a star safely, inexpensively, and easily." With over twenty years of entertainment industry experience each, they know the realities that have to be faced. "The casting couch is alive and well, unfortunately," says Squire, "plus there are scammers and predators everywhere. Sadly, this business can be dangerous, even deadly." With the popularity of entertainment reality shows like "American Idol," "America's Next Top Model," "Dancing with the Stars," and "Project Runway," more and more people are pursuing careers in the entertainment industry. This means more people than ever, especially teens, are at risk of being approached by predators and scam artists. The Superstar Safety Survey will be useful in ascertaining where people need more education. "This survey will really open people's eyes and make them more aware of what they need to know to protect themselves," Boulay commented. --  Five W's of photography shoot safety. --  Seven warning signs to spot an agency scam. --  Questions to qualify modeling schools. 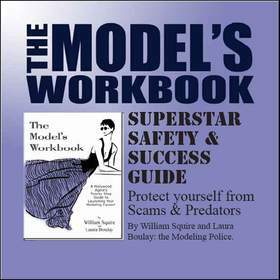 To complete the Superstar Safety Survey, visit www.modelsworkbook.com/survey. Authors Laura Boulay and William Squire are giving<br> 'The Model's Workbook Superstar Safety and Success Guide'<br> to people who complete their survey, which they hope will help<br> them garner information they need to help teens and adults<br> stay safe while pursuing careers in the entertainment industry.<br> For more information, visit www.modelsworkbook.com/survey.